Ironworks Brewery & Pub is located in Lakewood, CO on Alameda Pkwy. Ironworks sits on the eastern edge of Green Mountain, a popular area for mountain bikers and hikers, and is only a 15 minute drive from Downtown Denver. 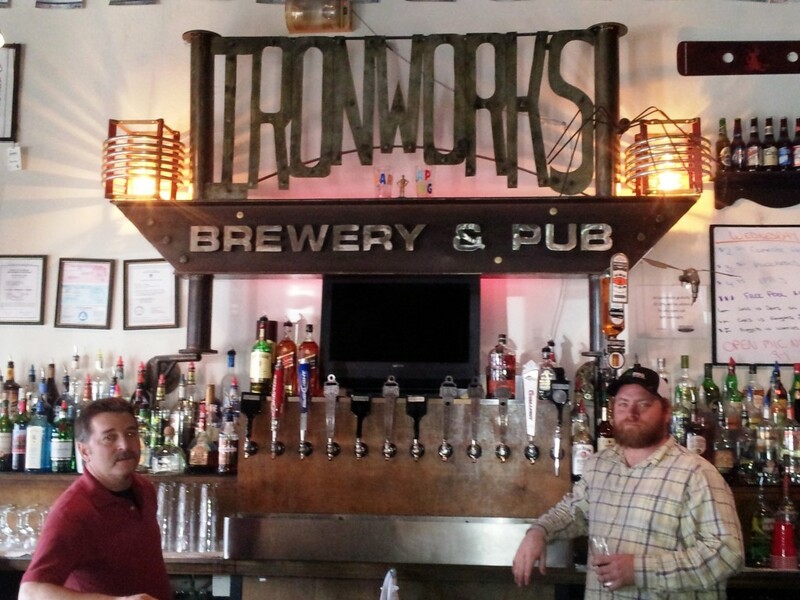 Ironworks has been brewing craft beer for nearly 25 years, or as they describe themselves, “Suppliers of great beer to all beer drinkers of Lakewood, Colorado, since 1989” (www.Ironworkspub.com). Ironworks Brewery & Pub was opened by a working class, blue collar iron worker that loved beer, and saved enough money to open his own brewery. The atmosphere at Ironworks is a direct reflection of the original owner’s blue collar roots, and has an industrial, hard-working feel. You’ve probably seen a movie where the main character works hard with their hands all day and can’t wait for the day to end. On the way home they stop at the local pub for a fresh beer from the tap, and have a beer with all of the other hard-working folks from the neighborhood. Ironworks could be the set for this type of scene. While Ironworks has an industrial, tough as nails appearance, their beer is outstanding, and as fresh as you will find anywhere in town. I was able to meet with Owner, Mike Mader, and Master Brewer, Mike George. It was great to find out the background of the name, and the history of Ironworks Brewery & Pub. Ironworks was the first craft brewery in Lakewood, CO, and went nearly 25 years as the only brewery in Lakewood (Caution Brewing opened earlier this year). Ironworks has great history, and is a staple to those living in the Green Mountain area. The brewing equipment at Ironworks is the same equipment that was originally used in 1989. While the equipment is the same, ownership has changed, and the production at Ironworks is on the rise. Mike George was proud to share that Ironworks averaged 350 barrels per year, prior to last year. In 2013, Ironworks produced 852 barrels of beer! The goal is to increase this number in 2014, while keeping the same great quality that Ironworks currently offers its loyal beer drinkers. Mike George has been brewing at Ironworks for two years. Prior to that he was a regular patron at Ironworks. Mike decided he wanted to try his hand at brewing, and started training at Estes Park Brewery. New to brewing, Mike worked at Estes Park Brewery and at Ironworks in order to learn as much as he could, often putting in 90 hour weeks. Eventually, Mike became the Master Brewer at Ironworks. Mike has been on a mission to improve the quality of all the beer at Ironworks, while also trying out new styles along the way. In my visit with Mike, it was obvious how much he loves beer, and that he puts everything he has into brewing great beer. He’s not happy sticking with the status quot, and is constantly stepping outside the box to try something new. A cool new addition in 2013 was a hop garden in the back of the building at Ironworks. Ironworks has been busy growing hops of different varieties that will eventually be used in some of the beer at Ironworks. If you’ve never seen hops grown, you’ll have to check out the hop garden at Ironworks. Mike’s passion for hops is not just evident in the hop garden. He’s working on a coop with 30+ breweries in the Denver area to ensure they have great hops available to them. There have been shortages of hops in the past, that have made it difficult for some smaller breweries to have the hops they need. To find out a little about Mike’s hop coop, check out this link: http://www.hop.coop/. Alameda Amber (5.1% ABV): Employees and patrons have been having fun with this one! The Alameda Amber is an approachable blend of nutty malt character and a touch of citrus hops. It is a good all-around ale “with training wheels”. The hops won’t knock you out; nor will the malt sweetness glue your mouth shut. You will enjoy the subtle addition of Rye and Honey Malts that round out Alameda Amber. Agave Wheat (5.4% ABV): Everyone’s favorite easy going style just got a new twist! This wheat beer includes the unique nuance of pure organic Agave Nectar and a hint of lime zest. The result is a sweet yet crisp and refreshing American Wheat. The allure of the agave leaves you wanting more. Green Mountain Pale Ale (5.5% ABV): For those that enjoy hops but can’t commit to the extremes of India Pale Ale, we offer Green Mountain Pale. This Pale Ale is a pleasant blend of malt and hops. Enjoy the heady, mouthwatering aroma of citrussy domestic hops without the debilitating alcohol content. At 5.5% ABV, it won’t put you under the table before you’re ready! Hop Killa IPA (6.8% ABV): The “Hop Killa” defies hop shortages, bringing you the resiny citrus blast that you crave in an American IPA. This beer has a fresh, clean hop presence that will leave you wanting more.Flavor and aroma additions include Summit, Mt, Hood, Northern and Columbus hops. Ironworks brewed 32 different styles of beer in 2013. They plan on brewing 40 styles in 2014, as they’re constantly looking to try new things. The beer at Ironworks is extremely fresh. It goes straight from the fermentation vessels to the serving vessels, then over to the tap! At this time, Ironworks does not distribute their beer outside of the pub. They do fill growlers, or any 64 oz container for $11 (IPAs are $12.50). If you want to purchase an Ironworks growler, they go for $5. Recently a bet between Colorado and California Congressmen included an Ironworks brew. If the Denver Broncos had lost to the San Diego Chargers last week, Ironworks would have sent their Pigskin Porter to California Congressman Scott Peters. According to Colorado Congressman Ed Perlmutter, “In Colorado, craft beer is as important as water to economic and job growth in our communities. As a Colorado Native, I’m confident the Broncos are going to Sic ‘Em when the Pigskin crosses the goal line.” While the Broncos won, and Ironworks didn’t ship off any of their beer, it’s pretty cool that they were included in this bet. I think it speaks to the quality of the beer at Ironworks that they were included in such a high profile bet. Activities: Ironworks has many activities throughout the week. Below is a list of the activities included at Ironworks. I had a fun visit with Mike George and Mike Mader at Ironworks Brewery & Pub. I was able to try out some of their beer, and really enjoyed the Battlecat Black IPA, and Green Mountain Pale Ale! Ironworks is a great example of a Colorado craft brewery that brews awesome small batch beers! I highly recommend visiting Ironworks, you will not be disappointed!